Hello, everyone, I'm Kevin, and if you couldn't already tell, I'm Ken's kid, and I'm going to tell you a story. 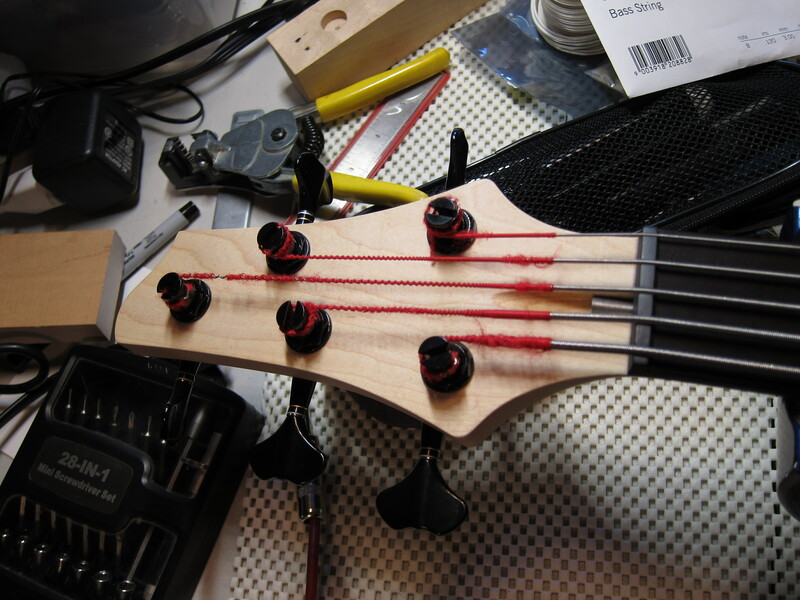 About 8-10 years ago I got it into my head that I wanted to build my own bass. Drew out the plans for a body, looked at necks and various pickup configurations, and studied the specs of a few preamps. Then, I discovered that things were a little pricier than I had first expected, and the vision of a bass that I could say I built got left on the wayside as Dad procured various instruments that he let me play. 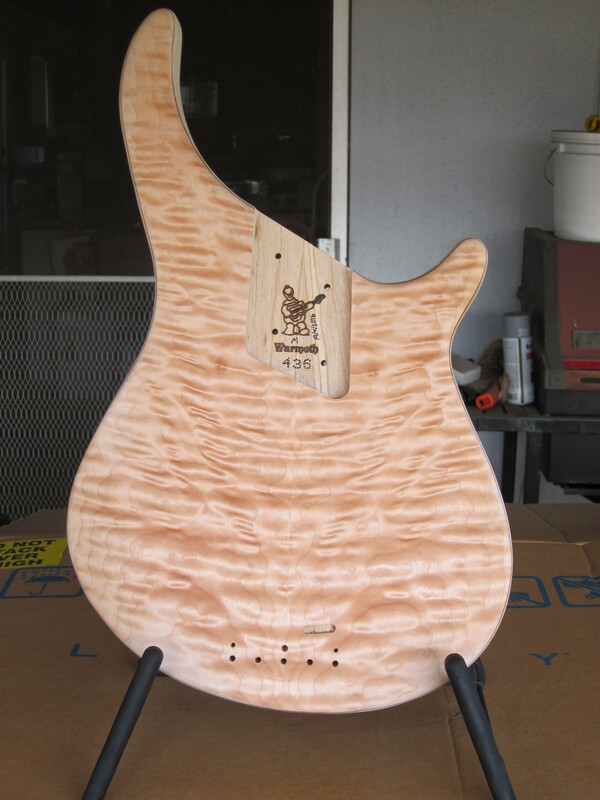 About a month and a half ago, I decided to start looking at it again, now that I am (theoretically) gainfully employed, and once again, I looked toward Warmoth for a neck and body. I had liked the look of their Gecko instruments way back when, so I looked at those this time around. I was kinda disappointed that they no longer offer Kahler bridges, but there are others out there. Because of the years of playing Dad's L-Series G&Ls, I didn't really have to look far for which pickups to choose, and he was very helpful when I was choosing the other electronics. I started looking at their custom body/neck selections, and 5 weeks ago, I took the plunge. Earlier today, a majority of the parts arrived. (Don't worry, there will be pictures at the end.) Things have gotten very real in the past few days. I have been asked to document this project of mine, and I will be posting updates here as they happen. Currently waiting on the pickups and that piezo buffer, then it'll be off to a local luthier to rout for the pickups and get the thing Plek'd. This is going to be a very interesting next few weeks. You still get the prerequisite "Welcome to BassesByLeo! Yes, it is! The body is a really beautiful piece of wood and it only weighs 3.5 pounds. Of course that's dry with no electronics, but it just feels stupid light to hold in your hands. 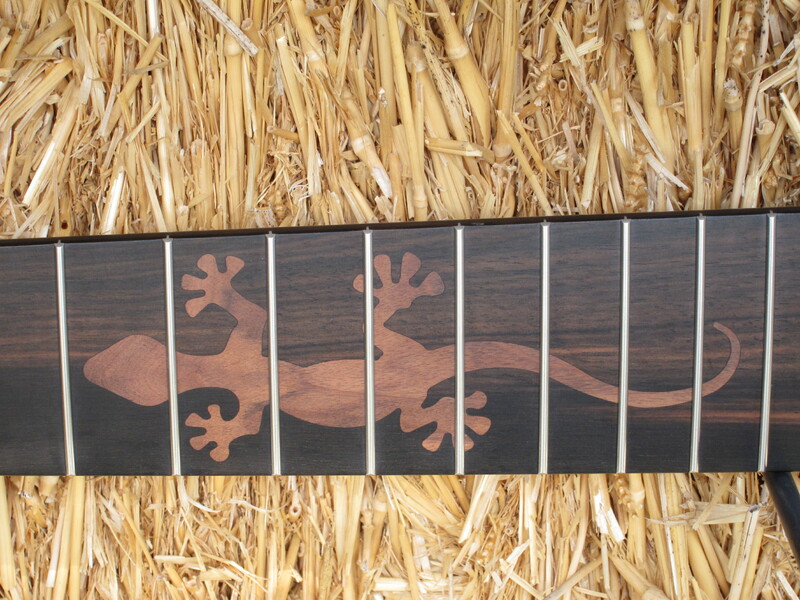 The neck is very nice as well with a great satin finish and smooth & clean fretwork. He's got a great project going. It should turn out remarkably well. K Model MFD's? What are those? I'm interested in your opinion of the G&L pickups with the "other" preamp. Mr. Mom wrote: K Model MFD's? What are those? "K" pickups are, for all intents and purposes, the same as regular L Series pickups. G&L uses them for factory single coil capability, L series only. The difference is in grounding and coil isolation. These pickups will be a weensie bit quieter than the regular pickup. 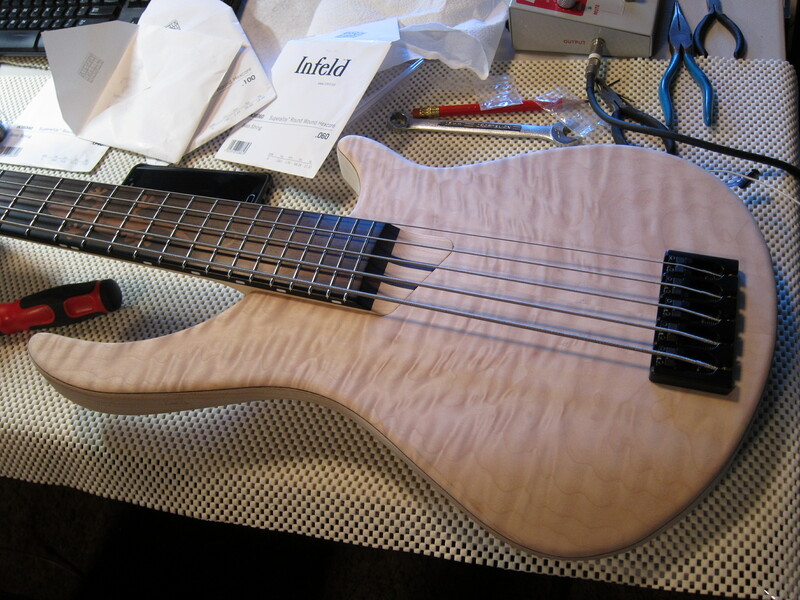 I've not actually played a bass with MFDs and Nordstrand. There are a few out there and they're well regarded. Mal might know of someone who has done this. 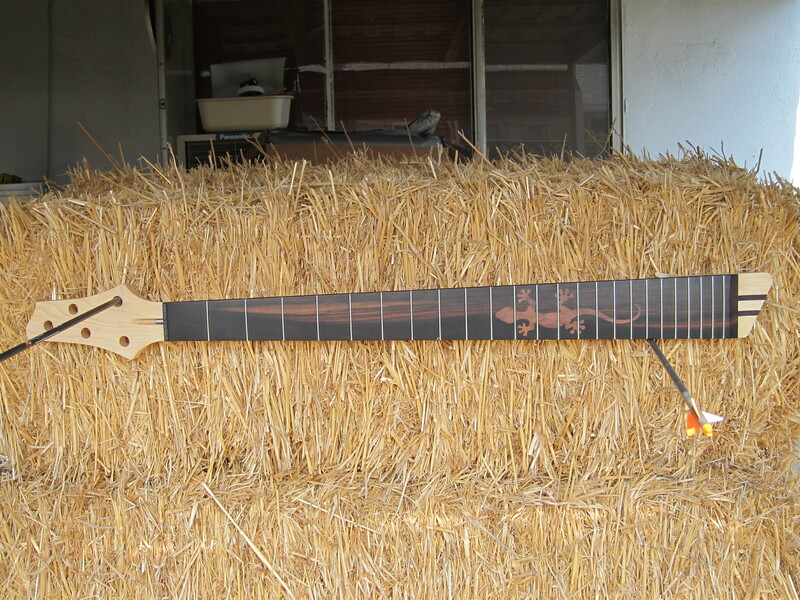 Ken Baker wrote: "K" pickups are, for all intents and purposes, the same as regular L Series pickups. G&L uses them for factory single coil capability, L series only. The difference is in grounding and coil isolation. These pickups will be a weensie bit quieter than the regular pickup. Looking froward to hearing updates on the build! I'll be watching this one, too. I like the Gecko look. Very nice Kevin! I especially like the hanging method for the neck pics. bdgotoh wrote: I especially like the hanging method for the neck pics. One of the piezo saddle wires was actually broken off of the saddle, so that's a warranty replacement. GraphTech was great, fast and helpful support. Hopefully I'll receive a replacement in the next few days. Did some cutting on the body with a forstner bit in a drill press, made a slot for the piezo wires to find their way over to the control cavity. Also cut away a bit in the control cavity to allow for 18v instead of 9v. Received the magnetic pickups today, and got a pickup cover over to a local luthier to produce a template for routing. He's got a bit of a backlog, so that'll be a couple of weeks. Dunno if there're rules about double posting, but they're probably made to be broken. Right? New update! With pictures, even! Bit the bullet a few days ago and reamed out the bridge ground wire hole a bit so I could run the piezo wires down to the control cavity. Didn't quite follow the original hole, but at least it came out still inside the control cavity. I'll just say that I don't think I like drilling like this with a driver drill. Today, I dropped the tuners in place, and with Dad's help, marked and drilled the pilot holes for the mounting screws. Once we got everything planned out, it went real easy. Final installation of the tuners was a breeze, as well. Once that was done, I got the bridge mounted to the body so I could (potentially) see how the piezos worked with the buffer. A little trial and error (and a rats' nest I forgot to take pictures of) and we got sound out of it. Strings are an old set of Infeld Superalloys. Thanks for the time, everyone.